I wanted something a bit different from my usual repertoire of fish dishes and, in my search across the Internets, came across this recipe. Since we’d accidentally walked away from the grocery store with a couple of extra bell peppers (oops! sorry! ), I figured this would put those wandering bell peppers to good use. Even though the original recipe was for salmon, I figured it would be fine for my seer fish, which is part of the mackerel family. Seer doesn’t have a strong flavour, so it’s pretty adaptable. 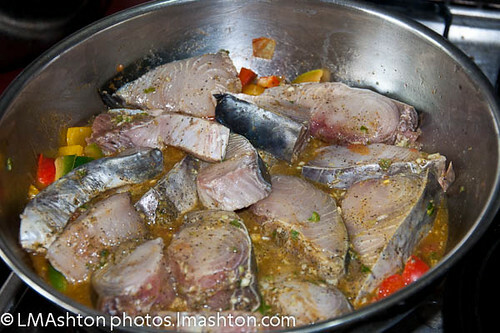 Mix together the salt, pepper, turmeric, lemon or lime juice, chilli peppers, and garlic, then marinade the fish in this mixture for at least a half hour. 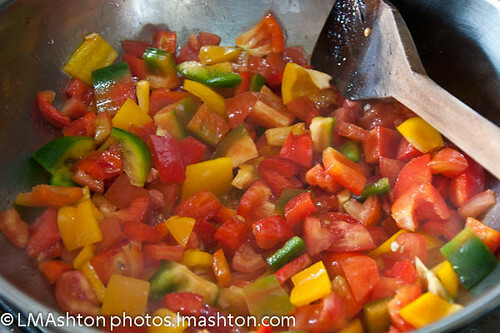 On high heat, sauté the bell pepper in the oil until semi-soft, about a minute or two. Add the tomato, and sauté for another minute or two. 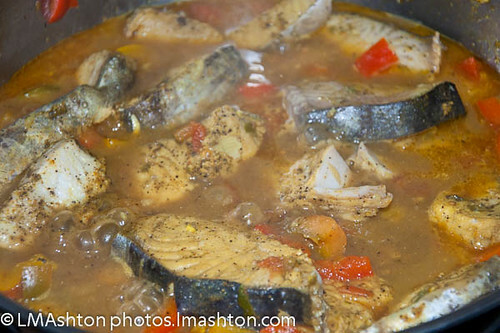 Add the fish mixture to the pot and add water if necessary. Lower the heat to low, cover, and let simmer for half an hour or so. The sauce will be thick when done. The photo below was about halfway through the simmering. At then end, the liquid level was much lower, about 1″ deep in the pot compared to about 3″ deep with fish. Remove the seeds from the green chillies if necessary, or use fewer of them, if you want a dish that’s less spicy. 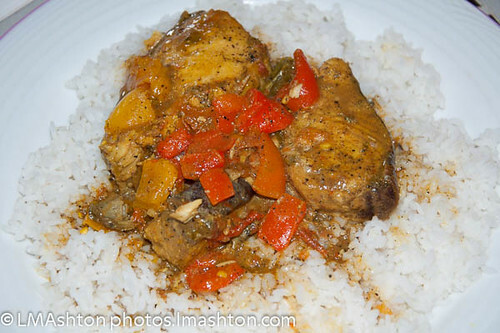 Do you think that this recipe would work with Tilapia? Lyra, I’ve never had tilapia that I know of, but from what I’ve read about tilapia, it seems that it’s a very mild fish with little flavour, meaning that it can quite easily be substituted for other fish in recipes. Buying the ingredients I don’t have for this dish tonight to make tomorrow. I’ll let you know the results. Okay I finally made the dish. My husband and I are not spicy people so I left out the green chilis. It was still a bit too spicy for us, we are total wimps, but did enjoy the dish. 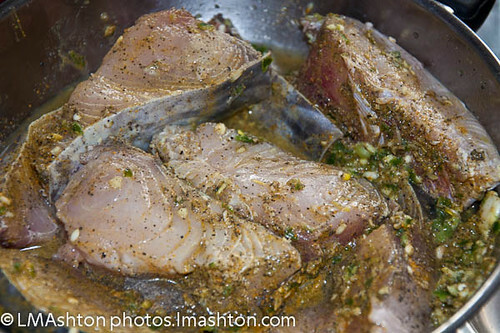 I used Swai fillets It looks like in your pictures you used seer steaks so that might have affected the taste? I’m not sure. I’m not that good of a cook yet. So for us, I would probably cut down on the ground pepper or try it with a different meat like beef or chicken or a thicker cut of fish. It’s a really good recipe and I will definitely try it again. Love for food has made me starting to cook and bake event build a culinary portal called Portal Kuliner. But what I love most is to meet and greet other people who share the same passion like you. Wow I think that this recipe is delicious , I never tried cooking fish with spices and curry maybe I can adopt something in your site, and I am sure my family will love this.